Overview: Getting things done in the city-state of Tempest requires knowing the right people. In Courtier , the first game in AEG’s Tempest line, you move among the social elite, building alliances with the right people to accomplish your goals. It’s all about having the right influence and power. Who Will Like It? The mechanics are a little bit like territory control, a little bit like set collection, but the experience is something else. I think player who like the theme — the idea of manipulating a royal court by influencing key players — will find that the gameplay fits the theme. Last fall, AEG announced Tempest, a new line of games that all take place within the same world, featuring the same characters. Unlike, say, Thunderstone , which also has something of a storyline carrying from expansion to expansion, the Tempest games are not all the same type of game. They’re interconnected, but not simply expansions of one other. 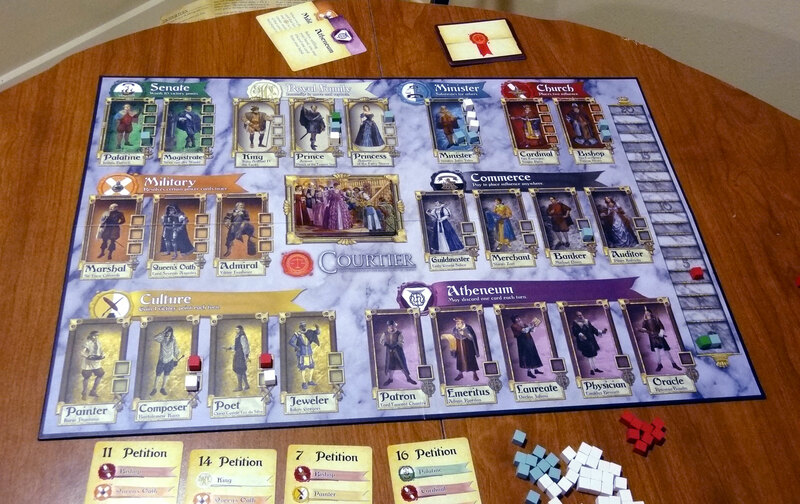 Courtier is something of a set collection game but not really; Mercante has auction mechanics and resource management; Dominare is territory control. All of it is set in the city-state of Tempest, and as you play the various games you’ll get to know different aspects of the various characters. There is a chronology to the games, and each one includes a short story to help set the scene. One of the interesting features of Tempest is that AEG has put together a Game Designer Resource, allowing designers access to the overarching storyline and even the artwork of Tempest, so that they can create games set in this universe and submit them to AEG. So far I’ve only played Love Letter and Courtier , but I’m very curious to see how Tempest will feel after trying out all of the existing games, and I’m particularly keen to see what sorts of games arise in the future. Courtier is all about exerting influence on the right people in the royal court in order to fulfill petitions from important folks you want to impress. The amount of influence it takes to push a person into action may vary; the court is also subject to the queen’s fancy, so things go in and out of fashion, making some people easier or harder to sway. The gameplay has enough flavor text that you could get into the theme, but it can also be played more abstractly if desired. At the end of Courtier , the queen is arrested for high treason — turns out all of that wheeling and dealing she did was plotting against the king! The “fashion” cards affect various courtiers throughout the game. The quality of the game components is fine: nothing outstandingly good or bad. The artwork is nice and fits the theme: the backs of petition cards are made to look like sealed letters. The various coteries each have their own seal and associated color, but everything is pretty easy to identify by the text anyway. You’ll notice as I review other games in the Tempest line that the character artwork carries over from game to game — although the games themselves involve different plots and mechanics, the characters become more fleshed out as you discover more about them in other games. The goal of the game is to acquire the most points by the end of the game (when the queen is arrested). Most of your points will come through fulfilling petitions, but there are a few other ways to gain points during the game as well. Setup: Each player picks a color, and puts one cube of that color on the scoring track on the board and then takes 15 cubes for their pool. The rest of the cubes, including the white neutral cubes, are placed in a reserve in the center. The petition cards are shuffled and one is dealt to each player — these are kept hidden. Four more petition cards are placed face-up near the board: these are open petitions that anyone can fulfill. Remove the “Queen is arrested!” card from the fashion deck. Shuffle the fashion deck and make two stacks of six cards each. Shuffle the “Queen is arrested!” card into one stack, and then put the other stack on top. (The other fashion cards are set aside and not used in the game.) The influence and power decks are each shuffled separately, set to one side of the board, and the top card of each is flipped over. Petitions that are harder to complete are worth more points. The primary way you gain points in Courtier is by fulfilling petitions — and to accomplish that, you have to influence key people to act. The more people it takes to fulfill a petition, the more points that petition will be worth. Some members of the royal court are harder to influence than others, too: each character has between one and five spaces for influence cubes on the board, and all the spaces have to be filled before that person is ready to act. Play one influence or power card, following its instructions. Discard any number of cards from your hand. Gain one influence cube from the reserve. The white-backed Influence cards let you place influence cubes on a character. Influence cards generally let you place one cube on some particular character, or on any character of a coterie. Some cards will let you influence any courtier on the board. You place your cube on an empty slot on that character — and if there isn’t an empty slot, then you can replace an existing marker. Power cards generally let you manipulate influence — for instance, swapping two cubes on the board, playing extra influence cards during your turn, or putting extra neutral influence markers on the board. There are also cards that will give you a few points, which are tracked on the scoring track. Black-backed Power cards help you manipulate influence. To complete a petition, each of the characters on the petition card must be filled with influence markers, and you must control each of those characters. You control a character if you have more influence markers on it than any other player (not counting the neutral markers). If you and another player are tied for most influence markers, then that courtier will not act on your behalf. When a petition is completed, you flip over the top fashion card and follow its instructions. Fashion cards will sometimes add neutral influence cubes to certain coteries, or else let everyone gain influence markers from the reserve. If the “Queen is arrested!” card is flipped, then the game is over. Finally, there’s one other factor that comes into play: the coterie abilities. Each coterie (e.g., Royal Family, Military, Atheneum, Culture) has an ability associated with it. If you have the most influence markers in a coterie (regardless of how many courtiers you control), then you control that coterie, and you get the card showing that coterie’s ability. Control of a coterie can change hands several times even within a turn as influence markers are placed and then cleared when a petition is completed. The Senate is worth 10 points if you control it at the end of the game. The Royal Family prevents other players from affecting your influence markers in other coteries. Commerce lets you pay influence to add influence markers before your regular action. The coterie abilities can be very powerful when used properly, and it can be worth maintaining influence in a coterie simply for its abilities, even if you don’t need any of those courtiers for petitions. As I mentioned earlier, Courtier is a territory-control game, at least mechanically, but it doesn’t really feel like territory control. You’re trying to control combinations of courtiers (there’s the set-collection aspect), at least until the end of your turn, at which point you can relinquish hold because you’ve fulfilled your petition. And sinceeveryone’s influence markers are cleared off a courtier when that particular person acts, it means that if you and another player are both trying to influence a character, only one of you will get to actually use that character. It’s a little bit as if you were playing Ticket to Ride , but you could count anyone’s trains for a route — and then every time you scored a route, all of those trains were removed from the board. This makes for some interesting strategic choices, but can also be incredibly frustrating to see your hard work wiped away by another player. It can feel harder to catch up in this instance: not only did the other player just score points, but they might have set you back from being able to score points yourself. There are a few powers that help balance out what could become a boring stalemate position when people are fighting over the same courtier. Notably, the Minister — a single-person coterie — has the ability to stand in for any other courtier in a petition, and this power can be used as long as you control the Minister coterie, even if the Minister himself still has empty slots. This makes him an incredibly powerful figure, though with five spots for influence markers, it can be a challenge to keep him in your control long enough to use his ability. There are also “Resourceful” power cards, which can be substituted for courtiers of a particular coterie — these offer another way to sidestep a contentious courtier battle. Since you only get to play one card each turn (unless your power cards allow you to play additional cards), turns go fairly quickly and there’s not too much downtime between turns. Also, since you need to watch who is gaining and losing control of courtiers and coteries, you do feel engaged even during other players’ turns: what they do matters to you. I did find that sometimes focusing only on completing your own petitions can distract you from another important strategy, which is interfering with your opponents’ aims. For example, even if you don’t need anyone from the Church coterie, you shouldn’t let another player use its “place two influence markers instead of one” power too many times, or they’ll very quickly be taking control of the courtiers you need. Sometimes you need to influence courtiers simply to take away coterie abilities even if you don’t plan on using them yourself. The game is fairly easy to learn, although familiarity with the types of cards in the power deck certainly gives you an advantage when planning strategy. There is a fair amount of luck — some of this is mitigated by the auction for starting hands, as well as the ability to buy a face-up card, but in the case when a face-up card isn’t of use to anyone, it may sit there for a while until a new petition is drawn. Courtier is a good introduction to the world of Tempest; it has solid gameplay but isn’t overly complex, and the board serves as a who’s who (at least in the royal court). It didn’t have a strong “wow” factor for me, but I like it enough to keep it in my collection. I’m really interested to see if the game will feel any different after seeing how these characters behave in the other Tempest games — if so, I’ll be sure to post an update here. Wired: Territory-control that feels like scheming and manipulating characters in a story; easy to learn with a reasonable game length for many gamers. Tired: Gameplay isn’t spectacular; can be hard to recover from losing influence when another player fulfills a petition.